The mission of the Health & Wellness Initiative is to be the most fit county by 2030 and serve as a model for high-quality, affordable healthcare for all residents. The Greater Hall Chamber has strong participation from the healthcare community meeting monthly to address business-related healthcare issues. The Healthcare committee is continuously providing programs such as healthcare reform seminars and events for residents to manage their health. Celebrating it’s 10th year in 2017, the Chamber’s Annual Chamber Chase 5K and 2 Mile Wellness Walk event is held in the spring with corporate and community teams. The event includes training incentives, free health memberships, and awards for teams with most spirit, the fastest CEO, and more! Click Here for more information. 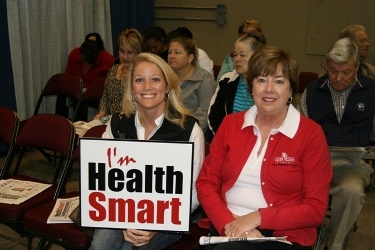 The Greater Hall Chamber holds an interactive wellness expo in the fall annually. This event gives the community and businesses an opportunity to attend for free health screenings, free wellness expo and to hear from award winning individuals on how they stay fit and HealthSmart. Contact Amanda Lewis, 770-532-6206 or email.